This operates totally differently to any can opener you have ever owned. The cutting wheel goes vertically inside the rim. Then instead of removing the top leaving it sharp and dangerous, a disk is cut out. Dispose of this safely and you are left with a smooth lip. Get some cling film or can covers and you can keep the tin for food storage in the fridge. 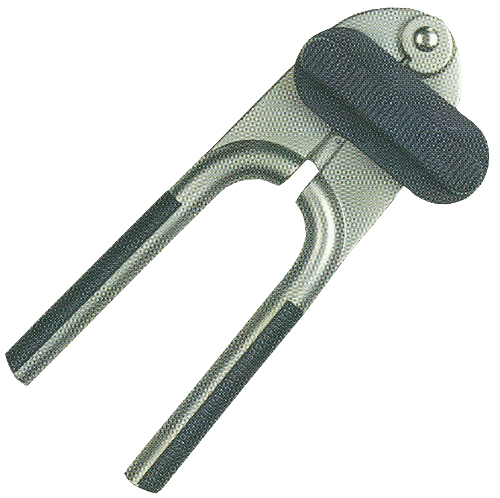 As well as working differently, the metal can opener screams quality and design. Manufactured from super strong zinc alloy it is sturdy and solid. The looks are great, the metal has a matt finish and the ergonomic ridged handle grips are, in current stock, a beautiful midnight blue. We think you will appreciate the action of this metal can opener as well as the improvement in looks and feel over regular plastic kitchen tools. Scissors With Jar And Bottle Opener Nutcracker. Metal Can Opener text, images and video are copyright.